Amethyst wedding rings are a beautiful option for couples interested in richly colorful rings that offer affordability and elegance in a non-traditional way. Amethyst is a type of quartz with a distinct purple hue ranging from light lilac to a rich, deep shade. The purple coloration is caused by iron impurities in the quartz crystal structure, and it can be replicated in synthetic amethyst stones. Darker, deeper shades are considered more valuable, though some couples prefer multi-toned amethyst that includes red, blue, or pink highlights. As the use of semi precious gemstones becomes more popular in both engagement rings and wedding bands, more jewelry designers are including beautiful examples of amethyst in their work. Amethyst is also a popular choice for bridal jewelry because of its symbolism. For the ancient Greeks and Romans, amethyst was used as protection from intoxication, and today it is considered a talisman against any addictions. The stone also has deep religious connections and is used in several faiths as a symbol of spirituality, sincerity, and purity, all characteristics important in wedding vows. The healing properties of amethyst are purported to reduce stress, calm negative emotions, and even ease headaches. As the official birthstone of February, amethyst can also be meaningful based on the wedding date, proposal date, or other significant date in the couple's relationship or personal lives. Art deco rings that feature large stones in bold patterns, often paired with other complimentary stones for a stunning design. Peridot, pink tourmaline, and sapphires are popular stones to pair with amethyst because of their complimentary colors. Figural rings that use amethyst's stunning color as part of a design such as a butterfly or flower. Wide band rings that take advantage of amethyst's relative affordability to incorporate very large gemstones. Eternity rings with amethyst gems encircling the finger, perhaps interspersed with other stones such as diamonds, tanzanite, or aquamarine for lovely color combinations. Three stone rings that add more symbolism to the design by representing the couple's past, present, and future. Regardless of the specific design, amethyst wedding rings frequently share similar characteristics. Cushion cuts, ovals, and heart shapes are the most popular designs for amethyst stones. Amethyst is frequently paired with other gems for added texture and sparkle; rings that use only amethyst gems are quite rare. White metals such as platinum, silver, and white gold are the most popular, since yellow metals can subtly alter the hue of the gem and amethyst with a yellow tint is considered the least valuable and desirable. Diamonds continue to dominate the marketplace for both engagement rings and wedding bands, and finding amethyst wedding rings can be a challenge. Because amethyst is February's birthstone it is generally easier to find early in the year, and it will frequently be displayed as a right hand ring or gemstone ring rather than a wedding ring. 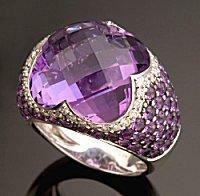 Couples interested in more unique amethyst designs should seek out specialty jewelers such as independent artisans who are willing to create custom rings with unusual gemstones. Another option is to secure a loose amethyst gem to have mounted in a semi mount diamond ring to create a unique wedding ring. Online shopping can also uncover a range of amethyst styles; the online retailer Gemvara has an extensive collection of exquisite amethyst rings available. Amethyst was once far more expensive than it is today, but the discovery of abundant amethyst deposits in recent decades has drastically reduced the price of the stones. Because amethyst wedding rings are not widely available, however, a couple may need to contend with the expense of designing and customizing a ring. Depending on the quality and size of the stone, the type of metal used, additional accent stones, and the overall detail of the ring, prices can range from $150 to more than $1,000. Amethyst is a relatively hard and durable gemstone but it does require proper care to look its best. Gentle cleanings and inspections should be performed regularly, and the ring should be kept out of chlorine and salt water, both of which could discolor the amethyst. The purple hue will transform into yellow shades if exposed to high heat, and over years deep amethyst shades may lighten with prolonged exposure to the sun. Amethyst rings should be stored away from light and carefully isolated from other jewelry so they do not inadvertently scratch or nick other pieces. Amethyst wedding rings are an unusual yet elegant option for couples to choose to symbolize their special commitment. With vibrant hues and a rich history, amethyst stones are sure to be treasured for years to come.